p(blue). Editor’s note: Today we are happy to introduce Marissa Lippert, who will take over the Health+Food column from Catherine Bennett Dunster. Lippert is a New York City nutritionist, writer, and cook. Whole grains are basking in the nutritional spotlight these days, and rightfully so. They’re a nutrient-rich, heart-healthy addition to your daily diet. Whole grains are part of the complex-carbohydrate family — healthful, good sources of carbohydrates that provide fiber, vitamins, and antioxidants to prevent disease and help keep blood sugar and energy levels strong and steady. # Several clinical research studies show that the fiber in whole grains helps lower LDL cholesterol and protect against cardiovascular disease. Researchers at Wake Forest University recently found that consuming an average of 2.5 servings per day of whole grains can reduce cardiovascular disease risk by more than 20 percent. # High-fiber foods, including whole grains, take longer to digest, stabilizing blood-sugar levels and hunger, keeping you more full on fewer calories. # Fiber helps regulate digestion and reduces the risk of digestive diseases, cancer, heart disease, diabetes, and obesity. Bran. The bran is the outer shell of the kernel and contains dietary fiber, B vitamins, folate, and such minerals as magnesium, zinc, and selenium. Together, these nutrients help prevent disease, promote healthy metabolism, and boost memory and immune function. Endosperm. The endosperm houses "good" complex carbohydrates and some protein and provides a good source of energy (or calories). Germ. The germ is an inner portion of the kernel that contains disease-fighting antioxidants along with E and B vitamins and a small amount of "healthy" polyunsaturated fat. 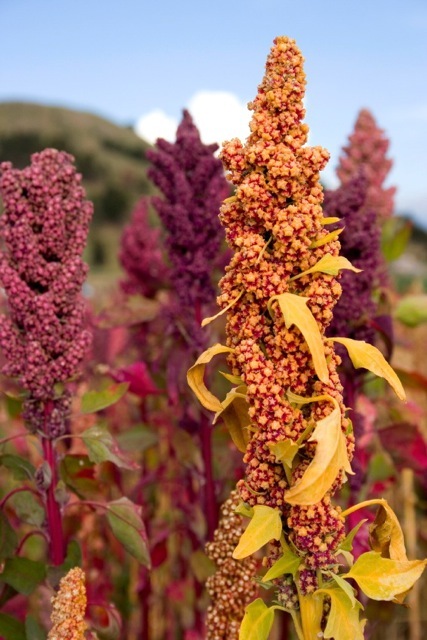 Amaranth: A staple of ancient Aztec culture, amaranth has a higher protein content than most grains (16 percent) and is rich in iron and fiber. 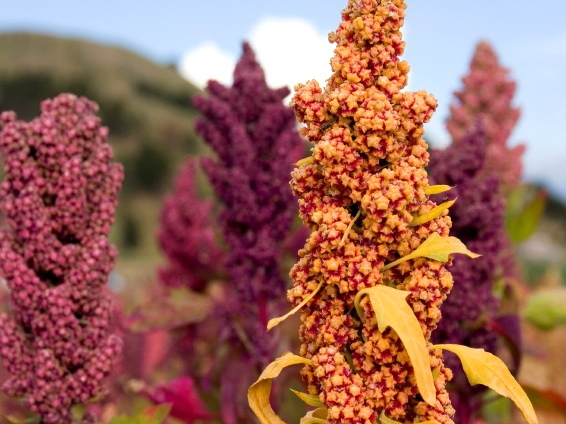 Amaranth is also gluten-free, so it’s an ideal grain for those with celiac disease or wheat intolerance. Great as a hot breakfast cereal or side dish. Bulgur: A versatile, high-fiber grain made from durum wheat, bulgur originated in the Middle East. It boasts a quick cooking time (less than 10 minutes); you can also simply soak it overnight. Bulgur makes a delicious side dish, pilaf, or salad (think traditional tabbouleh made with mint, parsley, tomatoes, lemon juice, and olive oil). Check out the Culinate [/articles/features/grain_glossary "grain glossary"] for photos and more descriptions of grains. Farro/emmer: Farro or emmer is another ancient grain grown in Italy and the Mediterranean. Farro can be used in side dishes, salads, pastas, and even desserts. Kamut: Another heirloom grain, kamut is a variety of wheat that dates back to ancient Egypt. Kamut has a buttery taste and is high in protein and vitamin E.
Millet: A hearty grain often served in India and Asia, millet is rich in magnesium and may help reduce the risk of cardiovascular disease and high blood pressure. In the U.S., it’s the primary staple of bird food, but don’t leave it for the birds alone. Millet can be red, yellow, or white, adding color to your plate. Quinoa: One of my own personal favorites, quinoa is fondly known at the “mother grain” of the Andes and was cultivated by the Incas. High in protein, quinoa is a good pick for vegetarians. It’s also gluten-free, cooks quickly, and boasts a nutty flavor. Good as a hearty side dish, salad, or cereal. Spelt: You may have seen spelt bread or cereal on grocery shelves. A variety of wheat, spelt is becoming more popular. This nutty grain packs in nutrients and fiber. Teff: This great grain from Ethiopia is rich in calcium, fiber, and protein. Teff has a sweet, nutty, molasses-like flavor and is typically baked into a hearty flatbread, but it can also be used in baked goods or cooked into a porridge or polenta. Like quinoa and amaranth, teff is gluten-free — a prime pick for those with celiac disease and gluten intolerance. The USDA’s dietary guidelines recommend that adults eat three to five servings of whole grains per day, but according to USDA research, nearly 40 percent of Americans consume less than one or no servings per day. Fortunately, it’s surprisingly simple to rack up your day’s worth. For example, if you eat one slice of whole-grain bread, a quarter-cup of dry steel-cut oats, and a half-cup of cooked brown rice, amaranth, bulgur, millet, barley, quinoa, teff, etc., you're covered. These words should be listed first on ingredient labels to ensure that you're getting a genuine whole grain or whole-grain product: 100 percent whole wheat, whole-grain wheat flour, stone-ground wheat, or whole grain/whole corn/whole oats/etc. Some products, however, may be misleading about their whole-grain content and may skimp on all parts of the grain. If the label sports any of these phrases, be wary: wheat, enriched wheat flour, made with whole wheat, multigrain, durum wheat, organic wheat, bran. Here’s where you can get into trouble with a number of mass-marketed cereals, crackers, "health" breads, chips, and cookies. Whole-grain products that get a stamp of approval contain 16 grams or more of whole grains and more than 2 or 3 grams of fiber per serving. So that colorful box of Fruity-Os cereal, touted to have 5 grams of "whole grains," doesn’t make the cut. What about the nutrients in whole-grain flours? Do whole-grain flours lose nutrients when they’re ground or cracked? No; when milled properly by stone mills at cold temperatures, whole-grain flours and "cracked" grains maintain their nutritional value and retain the bran and germ. However, when whole grains are milled into white flour, nearly 80 percent of nutrients are lost and fiber content is stripped away. This is why most refined flours are enriched and fortified with vitamins and minerals. Eat whole grains instead, and you'll get all the vitamins and minerals they naturally contain.